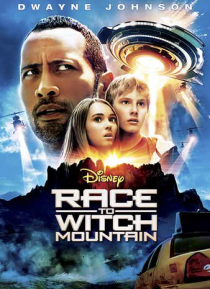 Fasten your seatbelts for the thrill ride of your life in Disney's fun family action-adventure RACE TO WITCH MOUNTAIN, starring Dwayne Johnson. Jack Bruno (Johnson), a Las Vegas cabdriver struggling to stay on the right path, gets an out-of-this-world incentive when two aliens, disguised as teenagers, suddenly appear in his taxi. In a race against government agents, an alien hunter and time itself… , Jack must help the children recover their lost space ship so they can return home and save their planet and ours. Breathtaking chases, close calls and special effects make this an action-adventure the whole family will enjoy over and over again.